On Sunday, June 2nd, I was in the vicinity of Eagle Lake, off Route 74 in the Pharaoh Lakes Wilderness of the Adirondack Park. My destination was a short little trail to a pond named Arnold Pond. This short .3 mile trail is about as short as trails get. The trail is on the north side of the road just west of Eagle Lake, but parking is on the south side of the road about a 100 yards east. The National Geographic map shows the trail ending at the pond. On the map, it looked like the pond was surrounded by a horseshoe shaped cliff (Skiff Mountain). There is a trail register a short ways in on the trail. I looked over the pages, and it looked like most people that have signed in recently are locals. It makes sense since the trail is so short. 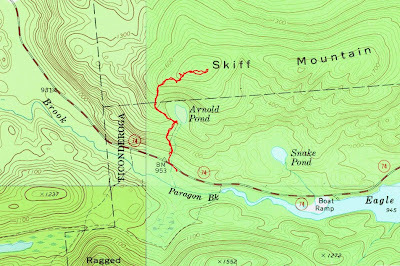 About half the people who had signed the register put Arnold Pond as their destination, while the other half put Skiff Mountain as their destination. That made me think that there must be a view from the summit of Skiff Mountain and there must be some kind of a trail. I’d keep my eyes open and see. The trail to Arnold Pond is steep right from the start. The trailhead elevation is 950 feet and the trail climbs 340 feet (rising to 1290’) by the time you reach Arnold Pond. There is supposedly a designated camping location at Arnold Pond, although the fire ring I saw was right at the terminus of the trail. I did not see any obvious camping spot. My dog Rev took the opportunity to get a drink and a swim in the pond. As I looked around and saw a herd path bearing left from the fire ring. It was pretty obvious. Soon I came to a posted sign. It was not directly I front, but on the right hand side of the herd path (looking towards the pond). I continued on, and there began to be a lot of rock in the landscape. At that point I began to see established rock cairns alongside the herd path. 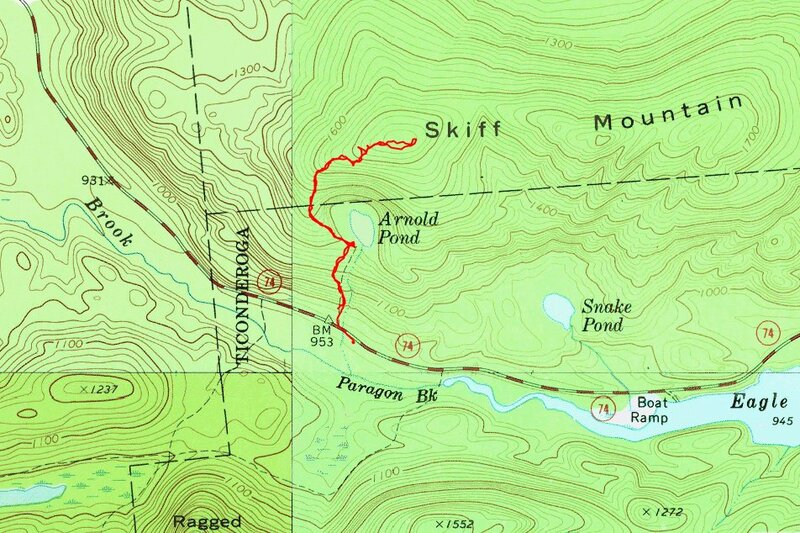 The route was clearly hooking around the west side of Arnold Pond and climbing Skiff Mountain. The hardwoods gave way to a mix of hardwoods and scrub pine. In no time at all I was beginning to crest the summit ridge. There were great views to the south. I could see Arnold Pond down below and had a good view of Pharaoh Mountain. If you look at the map, Skiff Mountain has a double summit. The true summit lies on the eastern flank. It appeared to be mostly wooded. I only went to the top of the western flank. A breeze was picking up and a rain storm was coming in. The breeze felt nice, and it kept the bugs away. Rev enjoyed the grassy shady areas on the ridge, while I poked around.I can see why many people had signed in with Skiff Mountain as their destination. It appears that this is private property, but I only saw one sign off to the side, and the herd path and cairns were obvious. If it is private, the owner has not made an attempt to discourage hikers from enjoying the fine summit. The distance from the trailhead to the western summit is almost exactly one mile. The elevation was 1775’. The true summit on the eastern summit is just above 1800’.